A global artistic and educational effort has been formed to raise the awareness of Iranian Youth on their Human Rights in form of an Art Competition. The World Academy of Arts, Literature and Media – WAALM, the awarding body of Persian Golden Lioness Awards is the initiator of this global endeavor. WAALM in co-operation with The Abbey College - UK, Award Winning Persian Vocalist, SATTAR and in association with Youth For Human Rights International – YHRI, USA developed this crayon drawing competition to educate and raise awareness of Human Rights amongst Iranian Youth all over the world. Human Right #18: “Freedom of Thought” is the topic for this contest. The top 3 winners will be awarded with a Diploma of Talent from WAALM, (signed jointly by its Founders and SATTAR) and receive a two-week English course scholarship at The Abbey College – UK. Moreover, the best 100 drawings will be exhibited in England and their artists will receive a certificate of participation as well as SATTAR’ s photo personally signed in their names. This competition is entry free and open to all Iranians around the world aged 13 – 19. Post Art Competitions to: (Human Rights Art Competition) TAC – International Office, 253 Wells Rd, Malvern, Worcestershire, WR 144 JF, England. Shab Sher organizers in New Jersey are pleased to announce a fabulous night with special guest participation by Ms. MAMAK KHADEM from California with her ensemble for this very special event. The program will start with dinner served elegantly by Fiesta and nostalgic music by Mr. Farhad Nazem and Mr. Korosh Mirfakhraei. Then the special presentation by the Mamak Khadem ensemble will follow. Mamak Khadem is a rising Iranian star on international stages and we are proud that she has accepted our invitation. You may check her web site at www.mamak-khadem.com. The program admission is only $40.00 which covers dinner, dessert, music and the special presentation. For further information, you may contact Jamshid S. Irani, Esq. at (201) 935-8033 or (212) 683-7700. May 30: Dr. Bakhtiyarinejad, "Towhid-e Islami"
Hello everybody…Hope you’re all having a wonderful day! 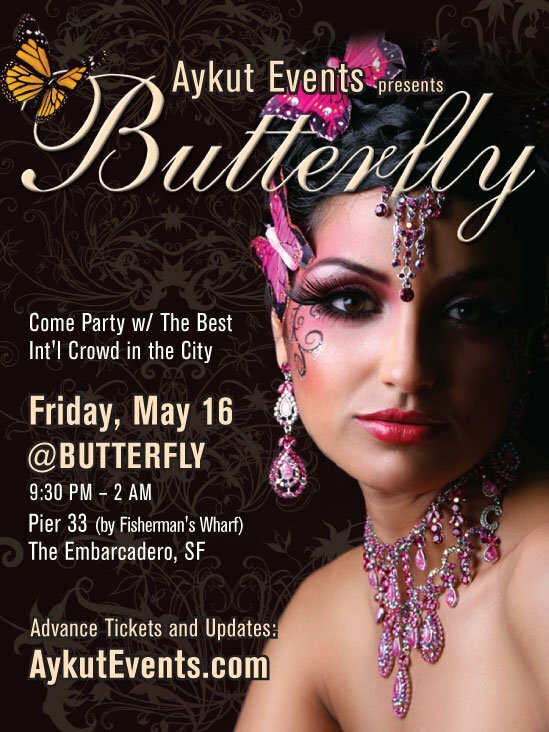 Now Can’t wait for This Friday May 16…We’re doing it at Butterfly (Pier 33).It will be another GREAT night w/ the beautiful views of the Bay!!! Beats to have you dance your feet off. Don’t miss it!! !